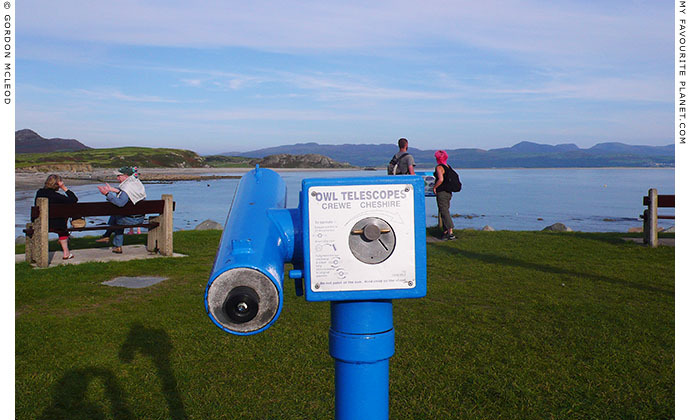 of Owl Telescopes, which stand sentinel around Britain's coastline. For those who still refuse to believe that owls use telescopes, here finally is the indisputable evidence. As yet, we have not been able to obtain a photo an owl using one of these devices, which they do at night, after the holiday-makers have gone back to their bed & breakfasts. But Gordon assures us that he is on the case and plans all-night vigils to capture these shy creatures' observing habits... as soon as he can obtain a camera lens which can cope with the tricky low-light conditions and an owl-proof thermos flask for his Earl Grey tea. 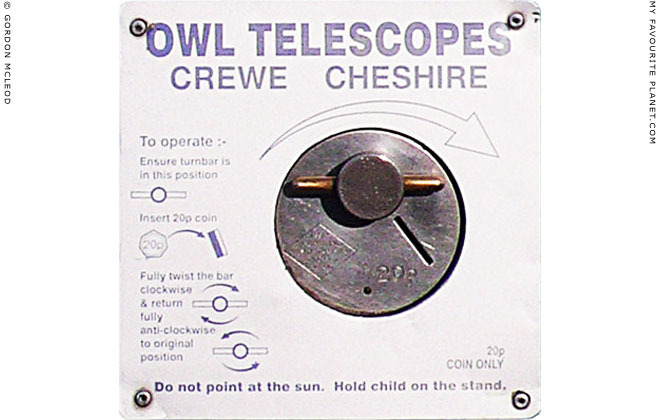 Handy cut-out-and-keep instructions for using an Owl Telescope. Do not point at the sun. The sun apparently gets very offended when people point at it, though this presents no major problems for nocturnal owls who do not indulge in such rude habits. The cunning telescope manufacturers have neglected to mention how many milliseconds of peeping time owls get for their money. We have not yet discovered how the owls carry all the 20 pence coins needed for a decent observation session, but we suspect they may have learned some tricks from the pelicans (not shown in picture). Hold child on the stand. Unfortunately, the manufacturers also forgot to provide the child one is required to hold on the stand, and since our intrepid photographer had not brought one with him, he was uncertain how he should proceed. So he didn't. The committee minutes can be read at the Llareggub public library. 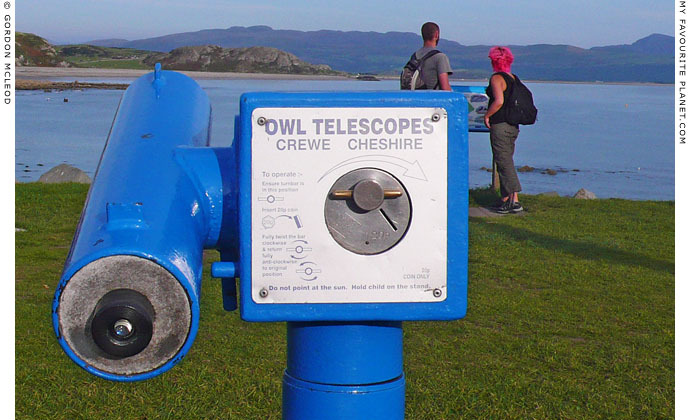 The Owl Telescope was originally invented by Mr. Tawny Owl of Crewe in Cheshire, the eldest son of the Owl and the Pussycat. His mother was actually a second cousin of the Cheshire Cat on her mother's side; the renowned Crewe branchline of the family. His father was one of the Barnes Owls. The parents' romantic sea voyage and moonlit wedding were immortalized in verse by the writer and artist Edward Lear (1812-1888) who was a close friend of the couple. Lear later became godfather to the young Tawny and encouraged his interest in observing distant objects. The land where the Bong tree grows has now been identified by scholars as being North Wales *, and it is no coincidence that Owl Telescopes can be found at several locations along the coast there. As a child Tawny Owl spent many happy summers with his parents at the Welsh seaside and vowed to contribute to the pleasure of future visitors, human and avian and alike. Mr. Owl senior had built a successful enterprise manufacturing optical instruments in Crewe, which explains the "plenty of money" mentioned by Lear. Owl junior had been fascinated by gazing through glass since his youth, so when he inherited the family business his mind was already set on expanding into telescopes. 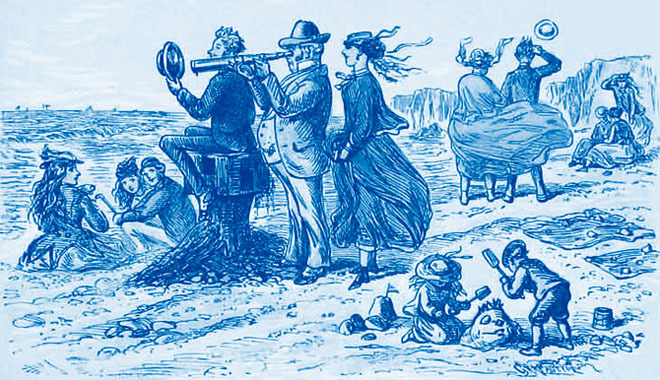 His early attempts at producing "telescopes for everyowl" were a little cumbersome (see illustration, right), and local authorities of Welsh seaside resorts were understandably less than enthusiastic about installing them, especially as two attendants were required to look after them. However the wise young Owl hit on two revolutionary innovations: miniaturization and automation. The more compact coin-operated Owl Telescope Mark VIII proved a resounding success, and the rest, as they say, is owlstory. According to Prof. Dai "the Book" Davis of Menai Bridge University, the pig who sold the ring to the couple for a shilling was none other than the Right Honourable Mochyn Mawr of Conwy who used the bob (which was worth a lot more back then) to buy into the Llanfairfechan Squirrel Cartel and made a fortune during the great 1871 acorn boom. gentleman watches Tawny's parents out sailing in their beautiful pea green boat. Illustration by Hablot Knight Browne (alias "Phiz"), 1867.
of precision telescope repair tools.